Nominated as one of "America's Best New Courses" by Golf Digest. Par 71 championship course graced by centurian oaks, lofty cypress pines and 12 challenging water hazards. 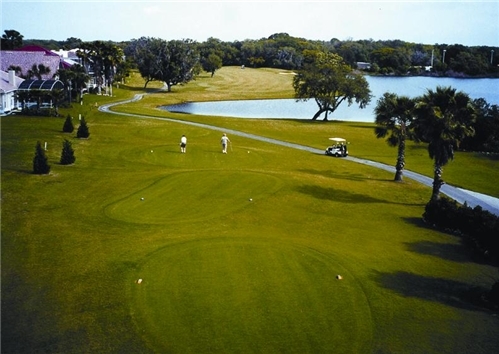 Kissimmee Bay and it's sister golf course Remington regularly run very special discounts and offers, be sure to register on their website to receive these. Especially worth mentioning is the "All you can" deal where you can replay without charge at both Kissimmee Bay and Remington, enjoy breakfast, hot dog and soda at the turn and unlimited practice balls in a unique Water Driving Range. Friendly staff, a well stocked Pro shop, 2 great and very affordable courses next to each other, unique water practice range and amazing deals makes Kissimmee Bay Country Club a must do on your vacation.